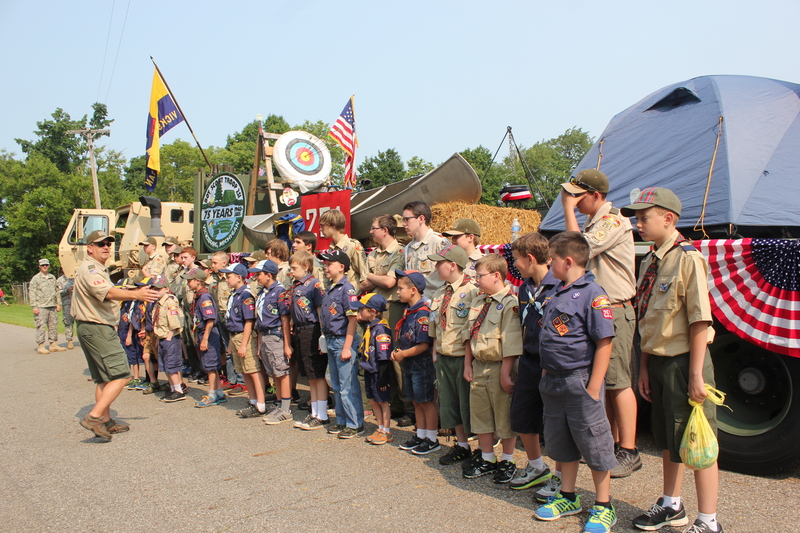 Kevin Borden lines up Boy and Cub Scouts in Troop 251 as they get ready to march in the July 4 parade in Schoolcraft. Raising money for scouting is important to help boys participate, according to Kevin Bordon, Vicksburg Boy Scout Troop 251’s scoutmaster. It costs approximately $3,800 for each boy to complete a year of scouting. Some is paid by the individual and the rest by the troop. Other bigger costs include the Boy Scout cabin on Barton Lake which needs a new roof, according to the volunteers who help keep the cabin in top condition. Many events were planned for the 75th anniversary of scouting in Vicksburg this year, but few were for raising money, Bordon said. To fill the gap, a “sporting clays” shoot and gun raffle will be held on Saturday, Aug. 22, at the Gun River Conservation Club in Plainwell. Sporting Clays is a challenging clay target game designed to simulate field shooting. The sport originated in England in the early 1900s as practice to hone the hunter’s skills. On a sporting clays course, shooters are presented with a wide variety of targets that duplicate the flight path of game birds, such as flushing, crossing, incoming and other angling shots. In the 1980s, sporting clays came to the United States. A raffle of a VersaMax shotgun, Ruger 10/22 Takedown rifle, Dave Ruimveld limited edition artwork, and a Steve Gettle limited edition signed photograph will be held during the noon lunch break. Tickets are $10 each for a chance to win. Described by some as “golf with a shotgun,” sporting clays has quickly become one of the top participation sports in the country, said Kip Young, assistant scoutmaster. At the Aug. 22 event, tickets to shoot are $75 per person, with teams of four costing $300. The advance tickets are available from Young at 269-998-3020 or from any of the other scoutmasters. Registration is online at www.troop251.eventbrite.com. The funds raised will go toward helping youth participate in scouting, including going to summer camp, Young said. It will also help to purchase equipment and gear for growing the Cub Scout pack and Boy Scout troop. There are currently 64 cub scouts and 34 boy scouts active in 251, with over 800 hours of service donated so far in 2015. Eight scouts are actively working on their Eagle Scout rank, according to Bordon. “Community engagement is what scouting is all about,” Young said as he made a pitch to the Vicksburg Rotary Club. The scout cabin on Barton Lake is in need of a new roof and some other upgrades. The Rotary Club and other members of the community helped to build and pay for the original cabin in 1948. Now it’s time for some costly repairs. Having the cabin is very important to retain scouts, as the kids get to be outside, enjoy and learn about nature, then sleep inside around the stone fireplace, he told the club. The Fresh Food Fairy brings her bike that powers a blender that makes smoothies. She was part of Kids’ Plate at the Vicksburg Farmers’ Market in July. 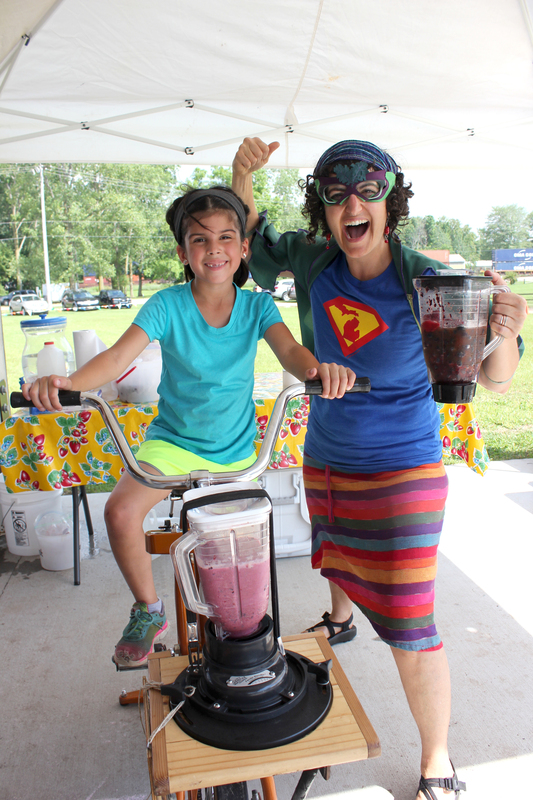 This good fairy in her lively costume taught children how to pedal a bike, to run a blender that turned out smoothies which this young lady put together from blueberries offered at the Farmers’ Market in July. Kids usually love to eat, but not always the vegetables and fruit that are deemed good for them. The Vicksburg Farmers’ Market volunteers aim to show children how very good fresh fruit can taste, according to Carol LaFrance. For the past three years, she and Penny Allen have planned and provided a chance for kids to learn how to prepare their own fruit and vegetables. Kids’ Plate will offer its final event of the year at the market for any child who shows up during market hours, how to make a veggie quesadilla, on Friday, Aug. 21 from 2:30-5 p.m. Much of the food for the monthly class is donated by the vendors at the market. Education is a big part of showcasing the market, in hopes that the families will return week after week for fresh produce. Brian Brook holds one of his metal sculptures that he sells at area art shows. Sculpture may be coming to a site in Vicksburg’s Farmers’ Market or one of the village’s parks. And residents will have a hand in its creation. The project, Public Art in the Park, will begin as a demonstration during market hours, 2:30-6:30 p.m., on Friday, Aug. 21. 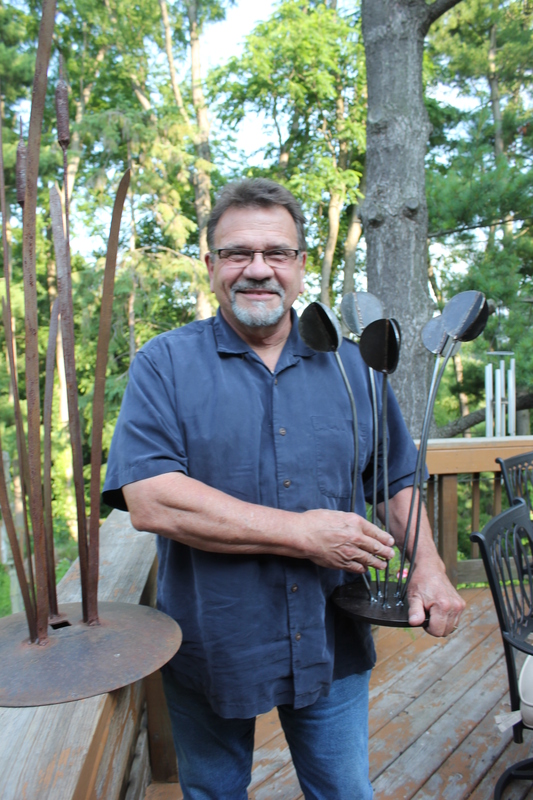 Brian Brook, a metal sculptor from Three Rivers, will donate his time and talent to build a piece of art that could eventually be placed there or in a park. But the process will begin even earlier. Brook is asking residents to donate pieces of metal that they would like to have included in the sculpture, especially if they have historical significance to the community. The market managers will be collecting donations on Fridays leading up to the 21st. Visitors to the market on that date are invited to watch him create with his drills, cutting discs, angle grinders, and oxygen acetylene torch to turn the pieces into art. He will not be welding on site. He will be using his brazing torch to fasten the pieces together. Brook began working with metal art as a student of Holly Fisher’s at the Smart Shop in Kalamazoo some thirteen years ago. He likes the challenge of taking interesting shaped pieces of metal and work with them to make a public sculpture. The result is likely to be somewhat abstract, he said, as he won’t know what he is getting to work with until that day. The final result will depend on what is donated. He grew up on a dairy farm in Bath where he learned a lot of skills–but not welding. He attended the University of Michigan and graduated from Michigan State University in 1979 with a degree in recreation administration, never dreaming he would become an artist. He was hired by Starr Commonwealth in Albion as a weekend recreation provider, then as a house parent and finally as the supervisor of a boys’ cottage where he provided group therapy as well as interventions. After leaving Starr, and traveling for the summer of 1981, he was recruited to be the recreation supervisor for Bendix Field Engineering Corporation (BFEC) in Saudi Arabia, where he worked for four years as recreation supervisor, human resources, providing orientation for new employees, and organizing travel services, medical care and mental health care for BFEC’s multi-national workforce. Upon leaving BFEC in 1985, he traveled the world for two and a half years, ending up circumnavigating the globe. He was interested in doing counseling so he enrolled for his masters degree at Western Michigan University in 1990. He has been the supervisor of psycho-social rehabilitation services in Van Buren County since then. His second job is metal art with a studio at his farm near Corey Lake, west of Three Rivers. He and his wife Judi, who is a weaver, raise llamas. She uses their wool for her creations. Cindy Krill has hosted his sculptures for sale at her annual November open house and sale at Prudential Nursery. Brook has also displayed at Kalamazoo Art Hops. Brook sells his work at seven or eight juried fine-art fairs throughout the summer and has pieces in public displays and corporate collections throughout the Midwest. “I like the creative process. When I see something extra good, it gets me thinking how to incorporate it in a design. “I can get into a groove in creating a piece and time becomes a different dimension. This is the other side of my brain, and I will enjoy putting it to good use with a sculpture for the Vicksburg community,” Brook says. 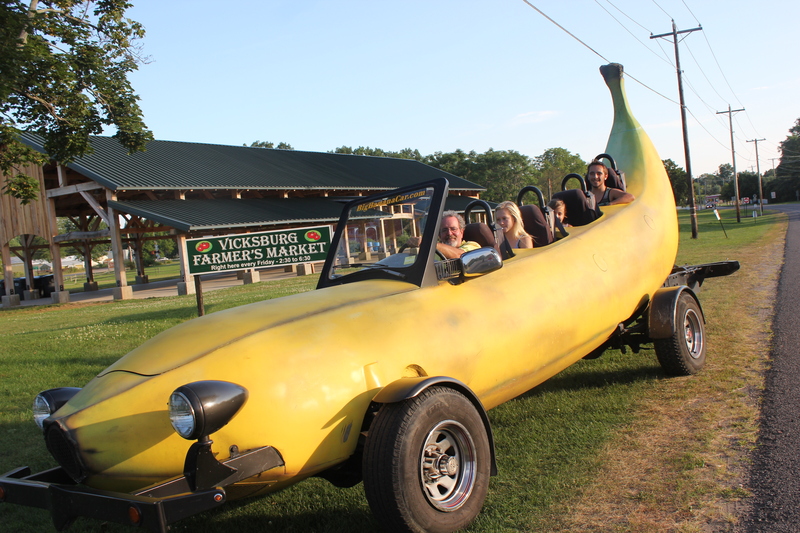 The Banana Car will make an appearance at the Vicksburg Farmers’ Market on August 21 to give free rides, sponsored by SC Enterprises. The passengers seen here are Tom Brown, Alyssa Kirby, with Taigen and Brady Copeland toward the back. From 3-5 p.m., Aug. 21, any child or adult that comes to the Vicksburg Farmers’ Market will receive a free ride downtown and back from the 300 N. Richardson Street pavilion. Scot Copeland, owner of SC Enterprises on North Street in Vicksburg is sponsoring the free rides which would ordinarily cost $60 for three people for 20 minutes. The Banana Car isn’t the only strange creation from this group. Brown and his business partner, Steve Braithwaite, have been constructing an even more eye-catching vehicle in their Kalamazoo shop: the Topsy Turvy bus, an upside-down bus that uses a regular bus as a base and has another one attached to the top deck of the bus, turned bottom up. They are also building a submarine sandwich car, while receiving guidance and materials from Copeland. SC Enterprises, with Copeland as its chief of imagination, is a fabricator and designer, using fiberglass and composites to construct such things as boats, cars, and even airplanes. The team of builders found him after purchasing expensive materials from a big box store, utilizing a Google search for help with their specific needs. “Scot is amazing. He is very friendly and interested in our project. He has offered great suggestions and will even volunteer his time to come to our shop and help us,” Brown exclaimed. Braithwaite is from England and grew up building hot rods. He came to the U.S. to go into business as an aerial photographer 25 years ago. He had the inspiration for the Banana Car when he saw a perfectly shaped banana and thought he could replicate it as a car. The building of it took two years. It has been road worthy since 2010, winning first place in the Houston Art Car Parade, the largest and most prestigious event in the world of art car aficionados that year. For the next two years the car was seen running up and down the east coast. In 2013, Braithwaite teamed up with his old friend Tom Brown from Kalamazoo and their aerial photography days. They had also been in business together selling green reflector signs that residents put on their homes or mail boxes to guide travelers, fire departments and EMS drivers. He moved to Kalamazoo to work with Brown on the Topsy Turvy bus, which has been commissioned by Ben Cohen, of Tom & Jerry ice cream fame. They are also working on the sandwich car which is about 80 percent finished, Brown says. “Steve’s the talent,” Brown says, “I’m just along for the ride.” Those who want a chance to take a ride, courtesy of Copeland, just need to show up at the Farmers’ Market on Saturday, Aug 21. Stefan Sekula and his co-commander Timothy Gora display the flag of the 84th Scottish Highlanders, the unit for which they are re-enactors. This unit served at Fort Michilimackinac. The Redcoats coming to Vicksburg? Maybe. No need to panic. 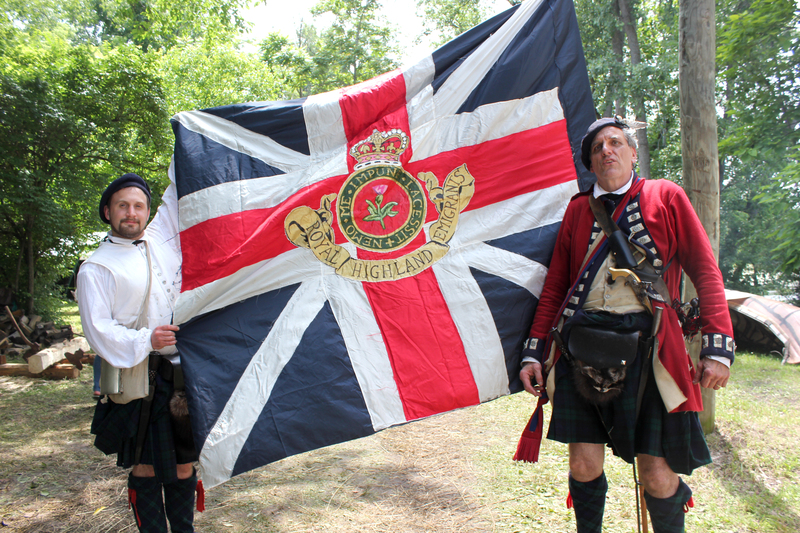 If planning becomes a reality, Revolutionary War re-enactors from both sides–British and Loyalists against Continentals and the militia, would battle at the village Recreation Area on June 25-26 next year. An application, funded by the Vicksburg Rotary Club, has been submitted to the North West Territory Alliance (NWTA) for their participation. Over 200 men, women, and children, would be expected to attend from the Alliance. Their responsibility would be to stage mock battles for the public to attend, according to Stefan Sekula. His 84th Scottish Highlanders would be the host unit from the NWTA, which has a calendar of re-enactment events that goes from May through October each year throughout the Midwest. Vicksburg’s Battle on Sunset Lake, as it is proposed, would take place as a scheduled event on the Alliance calendar. In return, local participants will actively seek sponsorships to support the skirmishers. This would include a mock battle in the Historic Village with the village renamed as Lexington, and the rec park as Concord, Massachusetts towns where battles in April, 1775, marked the start of the American Revolution. They would plan a parade through downtown Vicksburg, on Saturday, in conjunction with the Chamber of Commerce’s Taste of Vicksburg. Chief organizers of the event are the Boy Scouts of Troop 251, the Vicksburg Historical Society as the fiscal agent, the Village of Vicksburg, the Daughters of the American Revolution (DAR), Sons of the American Revolution (SAR), the Rotary Club, and the South County News. Other groups are currently being asked to participate, particularly when it comes to feeding the re-enactors on Saturday evening in the pavilion. The idea for such an undertaking began with the 75th anniversary camporee that the Boy Scouts in Troop 251 celebrated in April in the Historic Village. Sekula was invited by Troy Smith, a Boy Scout volunteer, to come in costume and help educate the campers about the Revolutionary War. He brought two other members of his unit, Ric Hansen, and Larry Hengesbach. The scouts were enthralled with the gear, the clothing, and the historic aspect of the Scottish Highlanders Sekula was representing. He was asked if they would come back again with lots more of his compatriots. Thus the idea was hatched for a full scale re-enactment. Sekula and his larger unit of the 84th Scottish Highlanders regiment have volunteered to be the host unit from the NWTA. This means he and his helpers will make decisions about staging the mock battles, recruit the re-enactors, and plan for their participation. The sponsors of the event will help with the expenses, promote the two days of activities, and provide the venues. The NWTA is dedicated to educating its members and the public about America’s Revolutionary War, a somewhat forgotten period of history, according to Sekula. This is mainly because the anniversary of the Civil War and the War of 1812, have been re-enacted successfully over the last few years. The Alliance aims to change this by reinvigorating its own organization with plenty of scheduled events in the Midwest. None of these occur in Michigan–one of the reasons the Vicksburg location would be selected. 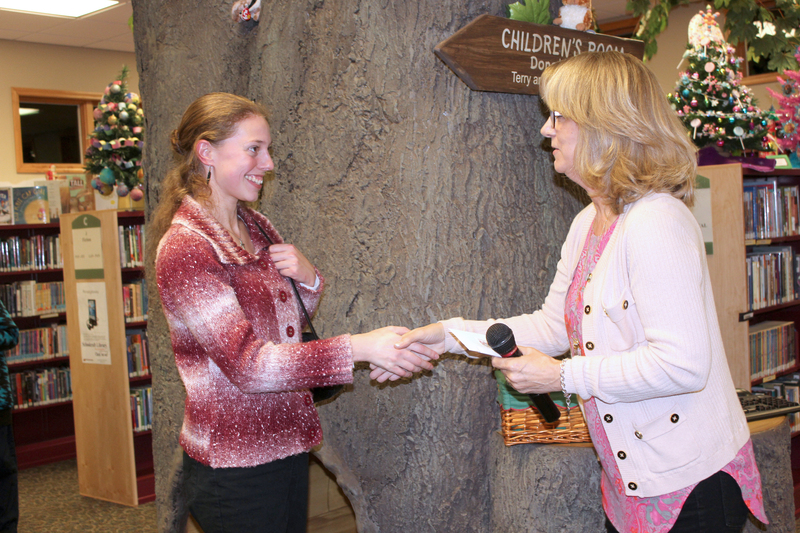 Debra Christiansen, right, congratulates one of the 2014 Tournament of Writers winners. Swords down, pens up, get clacking, go! That’s the mantra of the Schoolcraft Friends of the Library Tournament of Writers’ second year contest. Led by Debra Christiansen, it is an attempt to celebrate the many writers in all age groups that populate South Kalamazoo County, she says. Entries for the contest will be accepted from Sept. 8 through Oct. 16 at the Schoolcraft Library. They may be presented via electronic transmission, handwritten, or typed entries. There are many different categories for short story, fiction, non-fiction, memoir, or poems. Age groups are set up to give each writer a fair chance to compete, with junior, teen, adult, and senior divisions. New this year is the addition of a cover art contest. In 2014, all of the winners had their submissions published in a book that is available for $5 at the library or on Amazon called Small Town Anthology. “The thrill of seeing ones words in print is a great motivator,” Christiansen said. The judges are professional writers that she has recruited to read and evaluate the 19 entries received in 2014. She is expecting far more than that this year, with a grand prize winner and first, second, and third place winners for each age group and category. All entrants must hold a valid Schoolcraft library card or a reciprocal card. 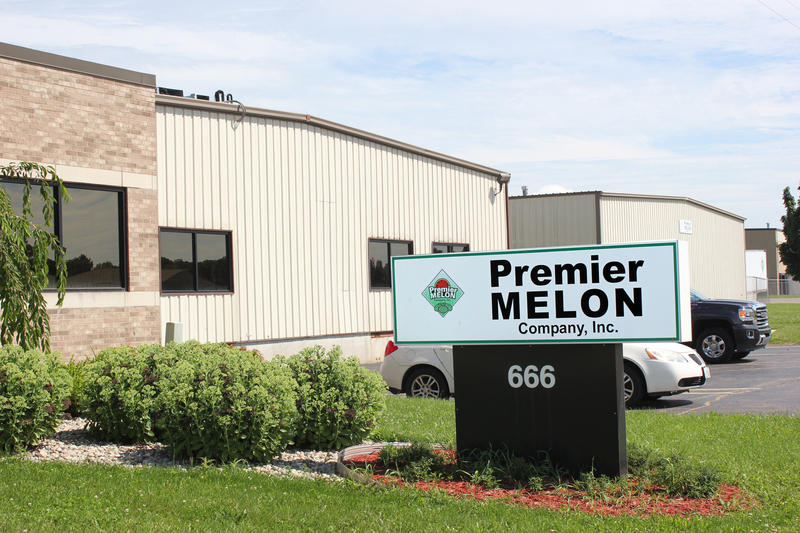 Premier Melon and Midlink Logistics are in this building on Angell Street in Schoolcraft. What’s the secret to selecting a ripe, seedless watermelon, now that it’s August and Michigan melons are coming ripe? Josh Bailey, president and owner of Premier Melon in Schoolcraft will tell you it’s the “ping” when you slap the melon. If it’s a good solid ping, that tells it all. Bailey ought to know. He supplies all of the local grocery stores in this area with Michigan watermelons raised by his growers on property in Michigan, Indiana, Georgia, and several parts of Florida. His business has grown at the rate of 25 percent each year since he started it in 2007. He is in a warehouse and office building in back of MacDonald’s restaurant in Schoolcraft. 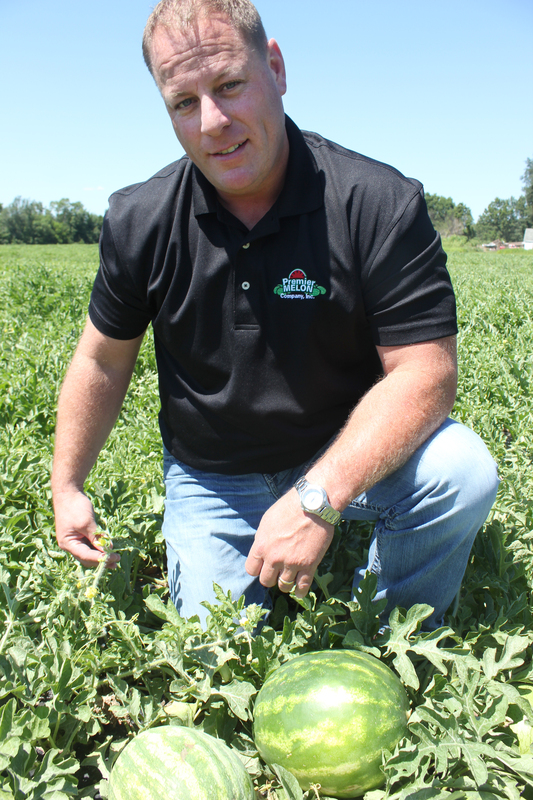 His crews will begin harvesting in Michigan by August 15, in the five fields he has contracts on in the Vicksburg/Schoolcraft area. The harvest will be over in about six weeks, but that doesn’t slow the company down for the fall and winter. They contract with growers in Mexico and off-shore the rest of the year, provisioning the major chain grocery stores all over the Midwest. His company is the chief supplier for watermelons to Wal-Mart, Costco, Meijer, Kroger, Safeway, Sam’s Club, Whole Foods and Spartan. Workers begin harvesting about April 15 in Florida and work their way north as the fields ripen. The process starts with cutters going in the fields to choose ripe melons between 10 and 25 pounds. The cutters are followed by field reps who walk behind the cutters to make sure of the quality of the melons that have been cut. They get turned over on their back to show the white belly for quick identification. Loaders follow next to pick up only those melons which have been turned over. Computerized equipment weighs the melons and sorts for store requirements. Sam’s and Costco want big melons, Meijer wants medium size and Whole Foods wants small melons. Premier ships to Canada too, mostly small size because of the cost of shipping. The chain stores buy either by the pound or the “bin”. The shelf life for seedless melons is about three weeks, those with seeds about half of that. Josh Bailey in his melon patch on Silver Street in Vicksburg. From the time the seed is planted in a greenhouse in Hartford, Mich., it takes about 90 days for a melon to ripen. Although there are many melon varieties, Premier Melon only plants a few varieties that seem to work best for the type of sandy/loom soil where they’re planted, according to Bailey. A host of transplanters move into the fields after plastic has been laid down. They punch a hole in the plastic and insert the seedling. The plastic holds the heat from the sun and keeps the weeds down. This year, because of the rain, the weeds had a head start in Michigan. That meant pulling them by hand. Disease is a concern. Fungicides are used to combat it. Bailey is also invested with two others in a Schoolcraft trucking company, Midlink Logistics. He realized after a few years that he could make more money if he had his own trucks. Now the company is hauling many kinds of produce. Food safety is a huge concern. Premier Melon invites a third party to audit their facilities. “The quality of our product speaks for itself. To guarantee the quality there are two very important considerations. You have to know when to start picking and when to stop,” Bailey said.